[시사뷰타임즈] 필러핀(필리핀) 현지에선 ‘옴퐁’이라 부르는 태품 망크훗 때문에 적어도 2명이 숨졌는데, 이 태풍은 퍼붓는 비와 흉포한 돌풍을 동반한 채 토요일 새벽 필러핀에 밀어닥쳤다. 숨진 두사람 모두 여자였는데, 비에 젖은 산비탈이 이 여자들 위로 무너진 것이었다고 프랑스 뉴스 통신사 AFP가 전했다. 망크훗이 필러핀을 가로지를 때 시속 270km나 되는 강풍을 동반했는데 이는 북부 캐럴라이너를 어제 강타한 훌로렌스보다 더 강력한 것이다. 사망자가 늘어날 가능성이 있긴 하지만, 손상 입은 것이 두려워했던 만큼 안좋은 것은 아니었다는 안도감은 있었다. “난 기도하고 희망을 가지면서도 사상자가 대단히 많지 않을까 걱정했다. 그러나 난 태풍 욜란다(현지에선 하이얀) 이후를 생각한다. 준비성, 조기 경보, 사전 대피 등 알게 된 교훈이 많다...그리고 이런 것들이 많이 도움이 됐다”고 했다. 5년 전, 초강력 태풍 욜란다가 필러핀을 강타했을 때, 6000명 이상이 숨졌다. 한 세대에서 겪은 가장 최악의 것이었다. 당시 집을 잃고 이주했던 사람이 거의 4백만명이었다. 그때 생존자들은 먹을 것, 물 그리고 의약품이 그 즉시 바닥났다. 그런데 태풍 망크훗이 필러핀 낭동부를 지나가자 더 많은 것이 소실될 것이라는 두려움이 여전히 있다. 국립재난위기감소 및 관리위원회 집행이사 리카르도 잘라드는 CNN에 사상자들은 구조대원들이었으며 현재 폭우로 두드려대고 있는 이 폭풍으로 산사태가 51건 있었다고 했다. 망크훗 태풍의 눈은 현재 남중국해 상공에 있으며 중국 남부의 홍콩을 향해 다가가고 있다. 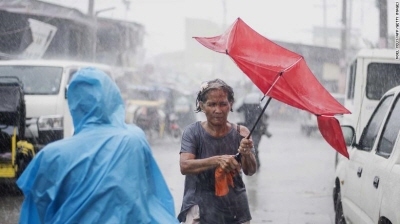 (CNN)At least two people have been killed by Typhoon Mangkhut, known locally as Ompong, which slammed into the Philippines early Saturday morning, bringing ferocious gale-force winds and pounding rains. Both victims were women, killed when a rain-drenched hillside collapsed on them, according to the French news agency AFP. Mangkhut, the strongest storm of 2018 so far made landfall on the northern tip of the island of Luzon, at about 1:40 a.m. local time. When it crossed land, Mangkhut was packing winds of up to 270 kph (165 mph), 120 kph (75 mph) stronger than Hurricane Florence that hit North Carolina. Although the death toll is likely to increase, there was some relief in the Philippines that the damage was not as bad as feared. "Honestly, we were expecting the worst from this," Edgar Posadas, a spokesperson for the National Disaster Risk and Reduction Management Council (NDRRMC) told CNN. "I was praying and hoping and worried about having so much casualties. But I think after Yolanda, after Haiyan [the international name for Yolanda], there were a lot of lessons that were learned in terms of preparedness, early warnings, preemptive evacuations... and this went a long way." More than 6,000 people died when Super Typhoon Yolanda hit the Philippines five years ago, the worst in a generation. That storm displaced nearly 4 million people. Many of the survivors ran short of food, water and medicine almost immediately. But as Typhoon Mangkhut passes over the south-eastern nation, there are still fears more could have perished. Ricardo Jalad, executive director of the Philippines National Disaster Risk Reduction and Management Council, told CNN that the casualties were rescue workers and that there had been 51 landslides across the region as a result of the storm which is now pounding the Philippines with heavy rain. Mangkhut's eye is now over water in the South China Sea and making its way toward Hong Kong and southern China.